Moving house so need gone. 4 off strong galvanised roof bars, one with full width ladder roller, off a LWB, mid roof Mk 6. Can't post a pic in the p.m. so heres one. This is a side upright that sits in the rain channel, the triangular piece clamps the upright to the rain channel. The 4 sets of horizontal holes are where the roof bars bolt into. From the bottom to the centres of the first set of holes is 120mm, then rising 35mm (between centres) of each pair of horizontal holes. Very helpful, I will try to get a firm to give me a price to collect from you and will let you know. Mk3 LWB 120, 2.0 litre convered to lpg/petrol; MK5 Travelhome 1989 reg. MK5 LWB 190 2.5 D 1998 mid roof camper / welfare work transport. 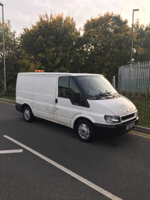 Mk5 Hi Cube lwb 2.5 TD 1999 reg. (Converting into a camper). Hey Terry, are these still available?